In January–February 2017, a salvage excavation was conducted at Nuris, near ‘En Harod Quarry (Permit No. A-7910; map ref. 221782–2328/730453–837; Fig. 1), prior to enlarging the quarry. 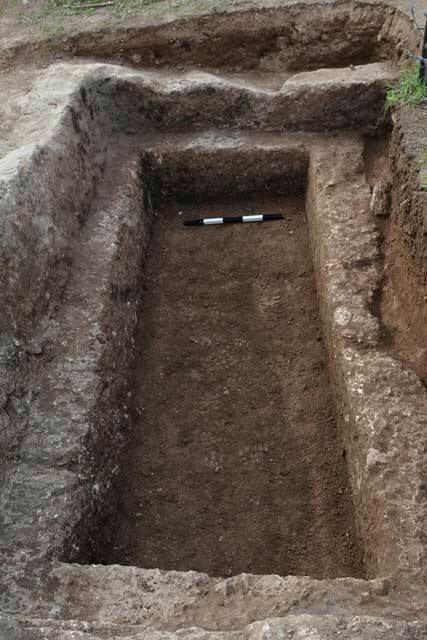 The excavation, undertaken on behalf of the Israel Antiquities Authority and financed by Lime & Stone Production Company, was directed by Y. Shalev, with the assistance of Y. Yaʽaqobi (administration), E. Bisharat (area supervision), R. Mishayev and R. Liran (surveying and drafting), M. Peleg (photogrammetric documentation), A. Shapiro (GPS and location maps), Y. Gorin-Rosen (glass), H. Tahan-Rosen (pottery drawing) and K. Covello-Paran (consultation and scientific guidance). ‘En Harod quarry lies on the lower slopes of the Gilboa‘, on the margins of the Harod Valley, near the community settlement of Gid‘ona. The quarry is surrounded by numerous archaeological sites, the largest of which is Tel Yizra‘’el, which lies c. 4 km to its northwest. 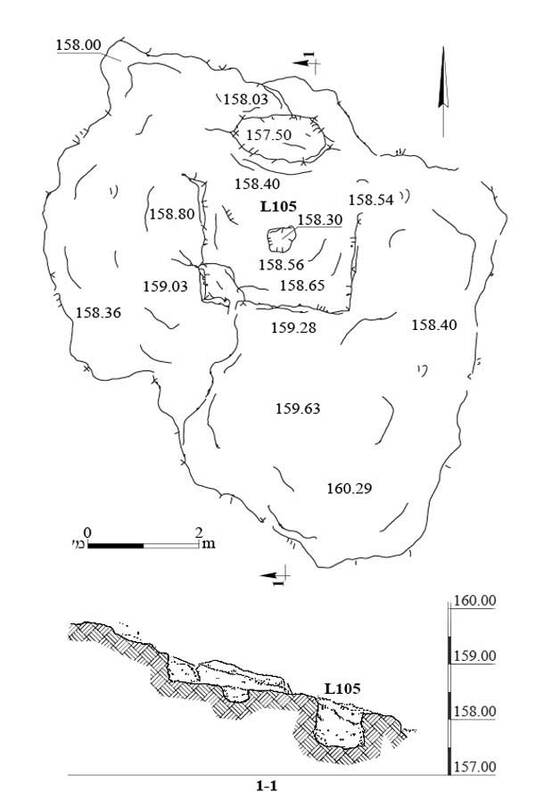 A survey conducted in the area by Tzori (1977) revealed an abundance of archaeological sites on the slopes surrounding the quarry. To the east, on the summit of Har Sha’ul, were fortresses and buildings from the Bronze and Iron Ages, as well as from the Persian and Byzantine periods. 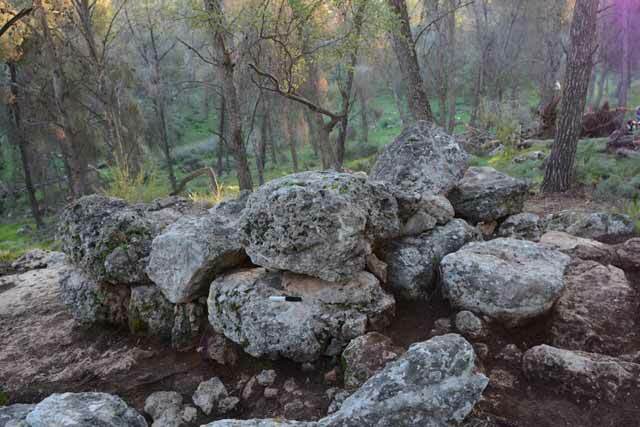 To the northeast lies Horbat Karemet (Giv‘at Yehonatan), where the remains of a settlement are surrounded by a large stone wall preserved to a height of c. 3 m. The site contains finds dating from the Chalcolithic period to the Iron Age II and the Roman period. Tzori proposed identifying it with biblical ‘En Harod, the city of Gideon. To the west of the quarry are the remains of the village of Nuris, where surveys recovered finds from the Bronze Age to the Islamic period; quarries, burials and installations were discovered in the surrounding area. The Nurit spring, near the site, served as the settlement’s water source. Several archaeological excavations were conducted in the quarry itself. A burial cave with several chambers, a sarcophagus and rock-hewn burial kokhim was exposed in the old part of the quarry. The finds from the cave date the burials in it to the Roman and Byzantine periods; it was also used as a dwelling cave in the Middle Ages (Syon 1995). 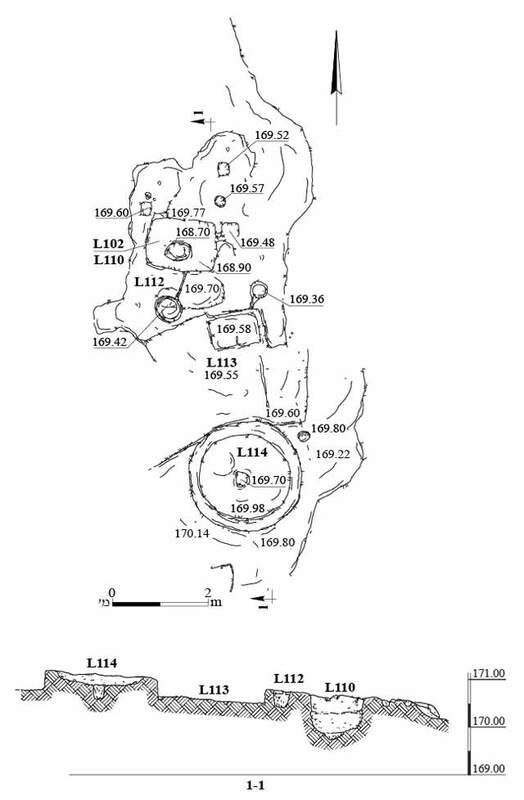 A development survey conducted in 2006 in the area around the quarry prior to its expansion located numerous remains, but mainly of caves, installations, quarries and field walls (Tepper 2009). 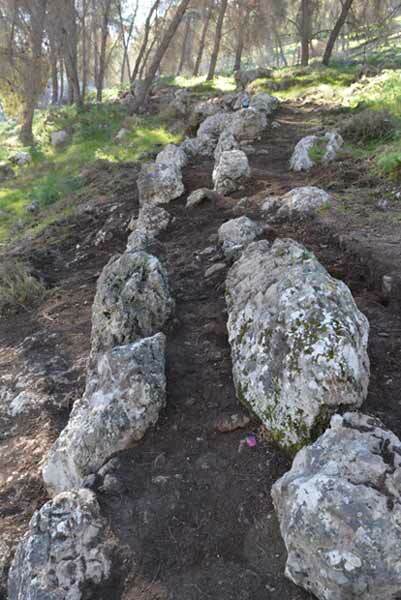 Following the survey, an excavation conducted in 2013 in the streambed of Nahal Yehonatan in the south part of the quarry, yielded ancient paths, stone-clearance heaps and agricultural terrace walls (Kohn-Tavor 2015). 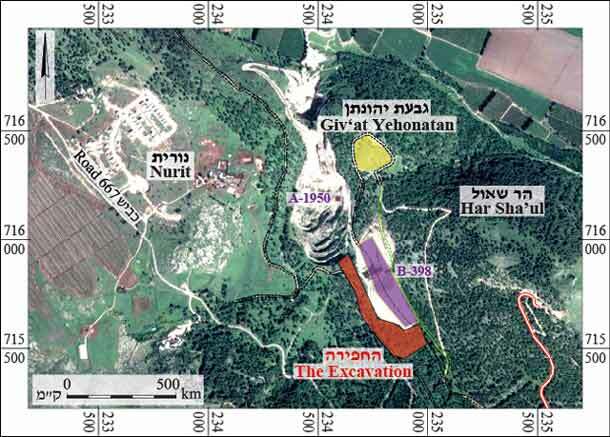 The current excavation was conducted on the southwest edge of the quarry, in an area extending to the south and west of the 2013 excavation, along the Nahal Yehonatan streambed. The excavation was conducted in approximately 15 spots across an extensive area, exposing the remains of 23 different features (Fig. 2). The main features exposed were agricultural and industrial installations, including winepresses, crushing basins, quarries and dams, as well as ancient paths and field walls. A small square building built of large fieldstones, probably a field tower, was discovered near one of the winepresses. A rock-hewn cist tomb was also discovered during the excavation. All the installations were found right below the surface, and it is difficult to date them with any accuracy. Nevertheless, based on the potsherds recovered from surface deposits, they probably date from the Late Roman and Byzantine periods. No. 1 was a simple winepress (L105; Fig. 3) hewn at the top of a small rock outcrop. It comprised a large, quadrangular treading floor (c. 2.0 × 2.5 m) with a roughly hewn, irregular elliptical collecting vat at one end. The vat was very large for the size of the treading floor; originally, it may have been smaller and more clearly defined, but widen out as a result of later damage, possibly from the roots of a tree that once grew there. A small rock-hewn hollow (c. 0.5 × 0.5 m) in the center of the treading floor was extremely worn but appears to have been square and was probably used for a screw press. No. 2 was a simple winepress without a clearly defined outline (Figs. 4, 5). It had a small, shallow, elliptical treading floor (L112; c. 0.8 × 1.5 m) and a large, deep quadrangular collecting vat (L110; 0.8 × 1.2 × 1.5 m; Fig. 6) hewn at one end of the treading floor; a round sump was hewn in the vat’s floor. The vat was full of small fieldstones and tamped brown soil. Three square cavities and two cupmarks were hewn in the bedrock surface north of the collecting vat. The square cavities apparently served to hold wooden beams in place, perhaps for roofing or for attaching some type of hand grip. In a later period, the winepress was annulled; a large, deep cupmark (depth c. 0.35 m) with a shallow channel running from its rim to the collecting vat were hewn in the treading floor. The cupmark indicates a change in the function of the winepress. Since the collecting vat appears too large for the small treading floor, the vat was probably originally smaller and was subsequently enlarged when the cupmark was cut into it, as the installation’s function was altered. The change in the use of the winepress may have been related to a crushing basin (No. 4, below) that was hewn in the bedrock to its south. At a later stage, a quarry for building stones (No. 12, below) was opened between the winepress and the crushing installation. The edge of the quarry damaged the treading floor of Winepress 2 but was deliberately placed so as to avoid damaging the cupmark that cut into it. No. 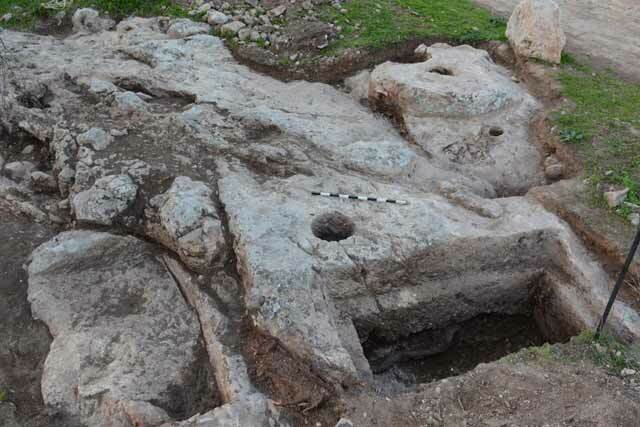 3 was a large complex winepress (Figs. 7–9) hewn and built on three levels following the incline of the natural bedrock from west to east. This winepress belongs to a type referred to as ‘Four Squares’ (Frankel and Ayalon 1988:53–58), with a square central treading floor, a round collecting vat, a quadrangular settling pit and two secondary floors. The central treading floor (L221; 3.7 × 3.7 m) was paved with a white mosaic, and most of it was hewn in the bedrock; its southwestern corner was built of ashlars that covered a natural depression in the bedrock. A round stone with a square cavity that served as a base for a screw press was set in the center of the treading floor. A subterranean gutter leading to a circular settling pit (L225; diam. 0.65 m, depth 0.67 m) was hewn through the eastern wall of the treading floor. The settling pit was paved with white mosaic and had near its floor, on its southern side, an outlet hole that led to a large, rectangular collecting vat (L222; 1.5 × 2.3 m, depth 1.5 m). The collecting vat was accessed via three hewn and plastered steps on its northern side. It was paved with a white mosaic, and its walls were coated with a layer of gray plaster embedded with ribbed body fragments of Late Roman- and Byzantine-period jars overlaid with a thick coat (c. 1 cm) of white plaster. The vat’s floor slopes to the southwest, toward a round sump (L230). A small, low step paved with white mosaic was hewn at the top of the vat’s southern wall; its function is unclear, but it may have been part of a work surface that surrounded the collecting vat. To the west of the treading floor, on a higher level, were two rock-cut triangular secondary floors (L219, L220); their truncated apex abutted the main treading floor. Their floors sloped toward the main treading floor, and a shallow channel hewn across each of them led to a deep, circular basin (L216, L217; diam. 0.55–0.65 m, depth c. 0.35 m) at their lower end. A small cupmark was hewn in the center of the upper part of Floor 220. A pit in the center of Floor 219 was formed by the roots of a tree that penetrated the surface, but the floor may have originally had another cupmark. No plaster or mosaic remains were found on these floors or basins. The rock on either side of the floors remained in its natural form, and no additional floors seem to have been formed there. A wide stone wall (W223), delimiting the winepress on the northeast, was built of large fieldstones. It apparently continued another 20 m to the northwest, toward a large field tower (No. 6, below). Complex winepresses of this type are characteristic of the Late Roman and Byzantine periods. 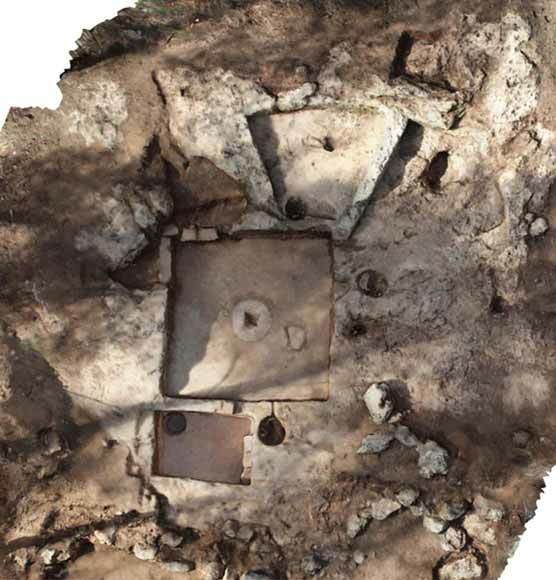 Similar winepresses, in which the main floor was surrounded by triangular or trapezoidal secondary floors, have been found for example at Mishmar Ha-‘Emeq (Avshalom-Gorni, Frankel and Getzov 2008) and at Horbat Siv (Sa‘id and ‘Ad 2011), although the main floor at these sites was surrounded by multiple surfaces on all sides. The size of such wine presses attests to an industrial installation that was used to produce large quantities of wine. In many of the Byzantine-period winepresses that included a central treading floor surrounded by cells or secondary floors, these were vaulted cells above which lay cells with mosaic paving. Dray (2003; 2011) suggested that the fermentation process occurred in the upper cells, and the wine was conveyed via the lower cells to the collecting vats. Others argue that the grapes were placed in the upper cells before they were pressed, and the self-extracting must flowed down to the lower cells through outlets in the floor (Ayalon, Frankel and Kloner 2013:23). Other scholars have shown that in many winepresses these were not built-up cells, but rather open raised platforms, some of which were linked to the treading floor via a large opening or an outlet hole that was closed with a bung; others, which had no outlet, included at times drainage basins near the treading floor (Avshalom-Gorni, Frankel and Getzov 2008, with references and parallels therein). In their opinion, the grapes were placed in these secondary floors before they were transferred to the treading floor, and the drainage basins were used to collect the first must extracted in the process. Nos. 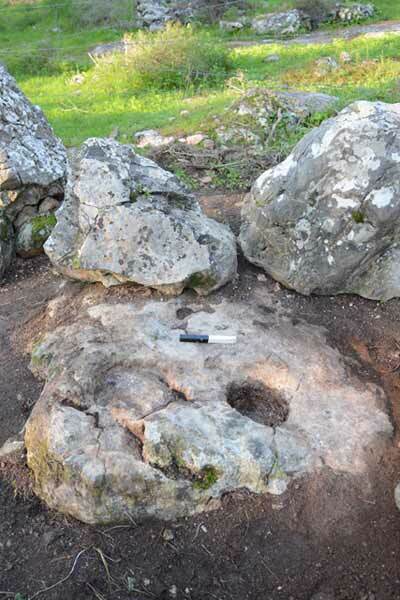 4 and 5 are two circular crushing basins with raised rims (L114—diam. c. 2.4 m, height c. 0.35 m; L116—diam. c. 2 m, height c. 0.35 m; Figs. 4, 5, 10, 11) hewn farther along the bedrock surface, south of Winepress 2. A square cavity in the center of each basin held an anchoring device for affixing the crushing stone that rotated above. Both basins exhibited quarrying marks around the cavities, indicating the presence of a raised rim that was later removed. The crushing device in these installations was probably rotated by hand, since the bedrock surrounding the basins was untouched; the rock surfaces around Basin 116 and to the south and west of Basin 114 were still in their natural form and bore no traces of a circuit for a work animal. Two cupmarks were found beside each basin, one small (diam. c. 0.1 m) and one larger (diam. c. 0.4 m), c. 1–2 m away. The larger cupmark near Crushing Basin 114 was hewn into the treading floor of Winepress 2, rendering the floor obsolete. Such basins were found at many sites throughout the country, often in farmlands adjacent to settlements. They are identical in form to basins used as crushing installations in olive presses and are therefore usually interpreted as remnants of an olive-oil industry. 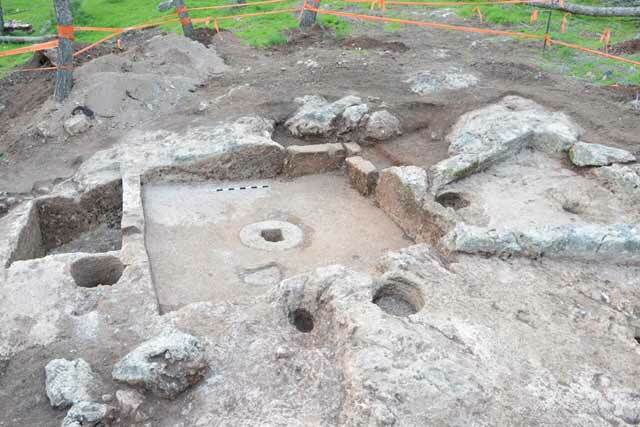 No olive presses or olive-pressing installations were found in the excavation area, either during the excavation itself or in the preliminary survey. 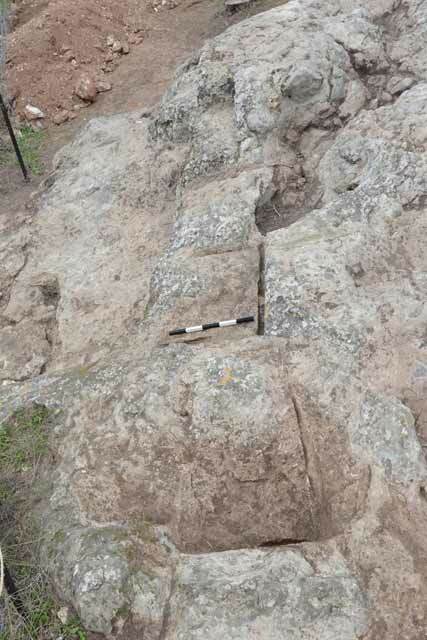 Similar basins with adjacent large cupmarks were exposed in an excavation at Zur Natan, where they were dated to the Roman and Byzantine periods. No pressing installations were exposed there either, and the site’s excavator suggested that the large cupmarks were used to press the olive pulp (Ayalon 1999; 2009). Nevertheless, it appears that such basins were not necessarily used solely for the production of oil. 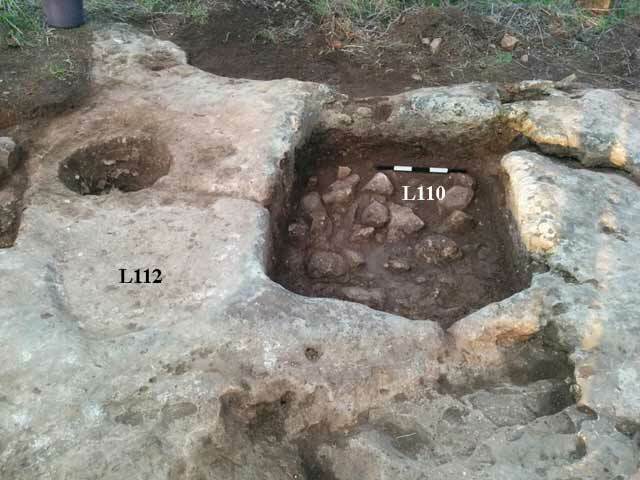 A comparative study conducted after two such facilities were discovered at Midrakh ‘Oz (Getzov, Tepper and Tepper 2017) suggests that similar crushing basins served for a variety of purposes beside oil production, as, for instance, chalk crushers or ‘grist mills’ for barley, buckwheat and other grains. At a later stage, the area between Basin 114 and Winepress 2 was converted into a quarry for the extraction of building stones (Quarry 12, below). The quarry did not cut into the crushing basin and left the circular outline in the rock intact. Furthermore, the quarry damaged the treading floor of the adjacent winepress without damaging the large cupmark that was hewn into it, suggesting that the crushing facility was still in use. It is evident that the workers extracted building stones from the bedrock between the installations as they were careful not to damage the crushing basin or the later phase of the nearby winepress. No. 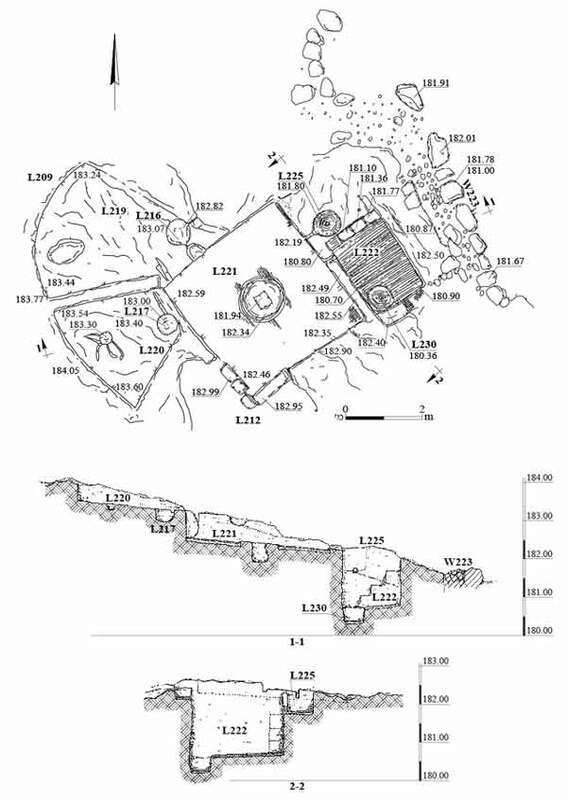 6 comprises the remains of a square structure (L208; c. 3.5 × 3.5 m; Figs. 12, 13) built directly on the bedrock near Winepress 3. Each of its walls, preserved to a height of three courses, was built of a row of three large fieldstones. A layer of small stones (L226) abutting the lowest course of the walls was discovered within the structure, in its western part. Structures of this type, which are very common in agricultural areas, housed guards, protected crops and served as preliminary storage facilities during harvesting. Due to its proximity to the complex winepress, the two may have been contemporaneous. No. 7 is a small installation (L228; Fig. 14) hewn near Winepress 3, west of the field tower. The installation comprised two adjacent small round rock-cuttings (diam. c. 0.1 m): a shallow circular and flat surface and a deep cupmark to its north. A shallow rock-hewn channel connected the two features. This is probably a very small bodeda, where olives were crushed on the shallow surface and the resulting oil was collected in the deep cupmark. The installation was hewn on the east side of a bedrock outcrop on which a wall (W200; No. 18, below) was built. The stones of the wall are placed next to the installation but do not overlay it; it is therefore difficult to tell if the wall rendered the installation obsolete or if the two features were used simultaneously. 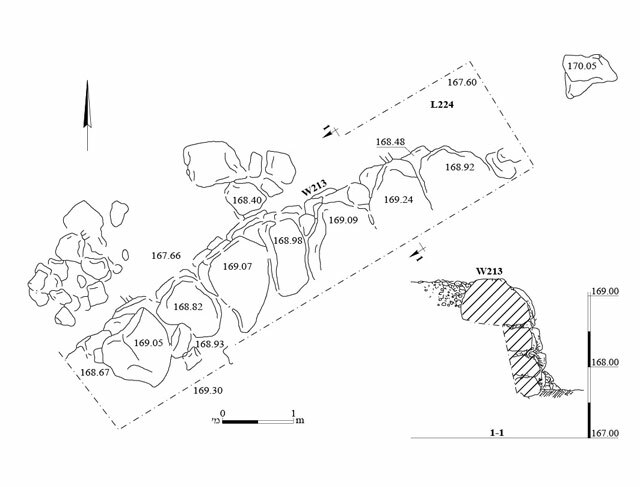 Several quarries for the extraction of building stones were discovered on the site’s numerous limestone outcrops (Table 1). Signs of rock cutting, severance channels and sometimes even undetached stones were visible in the quarries, allowing for the reconstruction of the dimensions of the quarried stones. The date of these quarries is unclear. The only pottery finds from the excavated area date from the Late Roman and Byzantine periods, and so the quarries should probably be ascribed to these periods. Table 1. The quarries (serial numbers refer to Fig. 2). 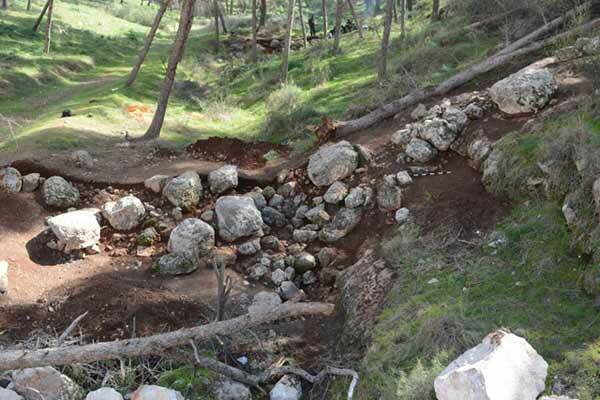 Two dam walls were exposed across the Nahal Yehonatan streambed, near a spot that is now blocked by piles of quarry debris. The walls, which are c. 40 m apart, were in all probability intended to divert the water flowing down the streambed and create terraces of alluvial soil suitable for cultivation. No. 16 is the northern dam (W202; Figs. 19, 20). It is a massive wall built of large boulders interspersed with small fieldstones that dammed the streambed and extended up its banks. A small channel—a stepped surface built of medium-sized fieldstones that ends with a channel hewn in the bedrock—runs through the wall, between the large boulders. This stepped system in the center of the wall probably served to collect water and direct its flow, as the long walls created a wide soil terrace where crops could be cultivated. No. 17 is the southern dam (W213; Figs. 21, 22): a wall slightly smaller than that of the northern dam. It was carefully built with neatly arranged courses of large boulders placed one on top of the other. Four courses were exposed, but the excavation did not reach bedrock, suggesting that the wall comprises additional course of stone. The wall crosses the streambed but does not climb far up the sides. The area yielded remains of long field walls extending down the slope, separating between plots and creating paths and access routes. No. 18 is a wall (W200; Figs. 2, 23, 24) that crosses the entire length of the excavated area along more than 200 m and continues for about 50 m beyond it. The wall was founded on the rock at the end of a high bedrock terrace. For most of its length is was constructed of a single row of large stones, but a section in its center consisted of two rows of large fieldstones with small stones between them. The wall is a very prominent feature, and the area immediately on its west is level and can be easily crossed by foot. 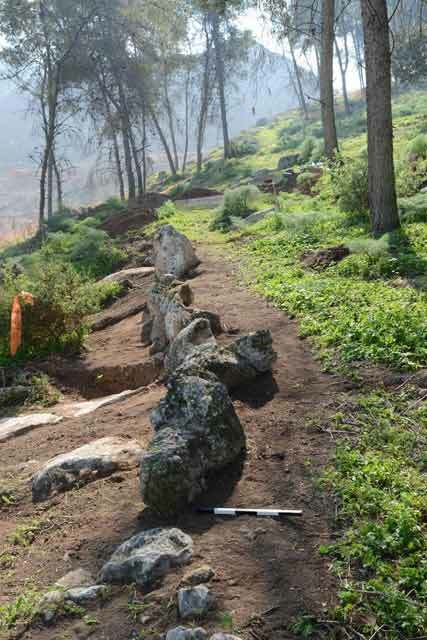 A nearby excavation yielded several field walls built as low terrace walls that incorporated natural rocks and supported a narrow path in accordance with the local terrain. 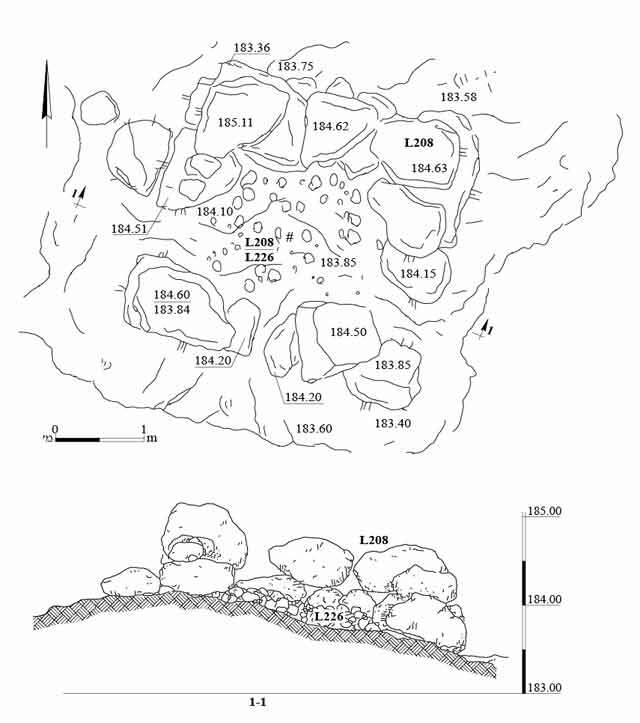 Such walls were interpreted as foot paths, which led from villages to agricultural plots (Kohn-Tavor 2015:37*). Thus, this wall may have been intended not only to delimit plots but also to serve as a retaining wall for a path, probably leading to the field tower and the complex winepress beside it, which are both located near the west end of the wall. No. 19 comprises the remains of a second field wall (W104; see route of wall in Fig. 2). It was built of a single row of large fieldstones, like W200, were discovered near the site of the crushing basins and slightly south of them. A small section (length c. 2 m) of the northwest–southeast wall was exposed in the excavation area; however, beyond the limits of the excavation another 50 m of the wall was clearly visible continuing to the southeast. No. 20 is another wall (W123; exposed length c. 30 m; Figs. 15, 25), discovered on the north side of the excavation area; it crosses over Quarry 8. The wall was built using two construction methods. 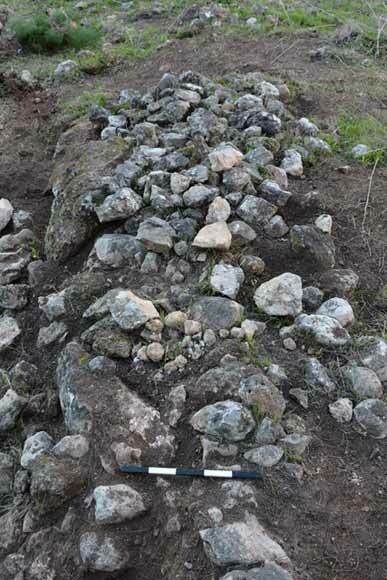 The north and south sections are built of a row of large fieldstones arranged on the ground, like W200. Between these sections, built over Quarry 8 and rendering it obsolete, a section consisting of three rows of small stones was exposed. The entire wall may originally have been built of large stones and its central part was removed when the quarry was established. This section was subsequently repaired with small stones when the quarry was abandoned. Nos. 21 and 22 are two rather small stone clearance heaps (L107, L108; c. 1 × 2 m; Fig. 26) that were documented. They were piled up on a natural rock surface. No. 23 is a large, rectangular rock-cutting (L120; c. 0.8 × 2.5 m, depth c. 1 m; Figs. 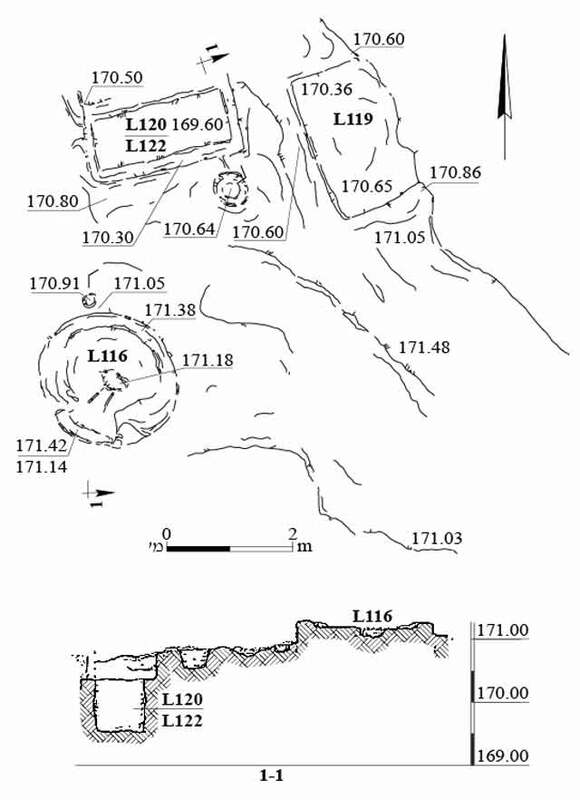 10, 11, 27), north of Crushing Basin 114—probably a rock-hewn cist tomb. A wide frame for laying covering slabs was hewn around the rim of the tomb. As the tomb’s floor was roughly hewn and not smoothed, sloping from east to west, it was probably not completed and never used. Although the tomb did not damage the crushing basins, it is highly unlikely that they are contemporary. A few hewn pit graves could be discerned in a high rocky outcrop, c. 50 m south of the excavation area. It is not clear whether all the tombs date from the same period; at some stage, the entire area may have been converted into a burial ground. Only a few pottery sherds were found in the soil deposits overlaying the bedrock; most of them are dated to the Late Roman and Byzantine periods. Some date from the Ottoman period. The handful of Byzantine potsherds recovered from the soil fill in Tomb 23 includes a cooking pot (Fig. 28:1). Fragments of other vessels were found in the soil deposits and stone surface inside the field tower; these included a Roman-period jar (Fig. 28:2) and a small glass fragment of a bowl or juglet base dating from the Late Roman or Byzantine periods (not illustrated). Ribbed body fragments and the rim of a Byzantine jar (Fig. 28:3) were found between the stones in the collecting vat of Winepress 2. The soil deposit in the collecting vat of Winepress 1 contained a fragment of a brik-type jar (Fig. 28:4) from the Ottoman or British Mandate period. Since all the pottery finds were recovered from the topsoil or in fills deposited in abandoned installations, they had no clear archaeological context. While the excavation exposed installations and tombs, no remains of residential buildings were found. Two clear phases were detected at the site. During the first phase, the area was used for wine production and the second phase attests to the transition from a wine to an olive-oil or grain-milling industry. There may also have been a third phase when the site was converted into a burial ground. Relatively few pottery and glass fragments were recovered but except for three from the Ottoman period, the remainder date from the Late Roman and Byzantine periods. The installations and walls exposed in the area were therefore probably built in these periods, when the site was an open area outside a settlement and part of the farmland surrounding the residential zone. Avshalom-Gorni D., Frankel R. and Getzov N. 2008. A Complex Winepress from Mishmar Ha-‘Emeq: Evidence for the Peak in the Development of the Wine Industry in Eretz Israel in Antiquity. ‘Atiqot 58:49–66 (Hebrew; English summary, pp. 65*–67*). Ayalon E. 1999. The Open-Air Oil Presses of Western Samaria. In Y. Eshel ed. Judea and Samaria Research Studies 8. Ari’el. Pp. 115–126 (Hebrew). Ayalon E. 2009. The Open-Air Presses at Zur Natan. In E. Ayalon, R. Frankel and A. Kloner eds. Oil and Wine Presses in Israel from the Hellenistic, Roman and Byzantine Periods (BAR Int. S. 1972). Oxford. Pp. 163–165. Ayalon E., Frankel R. and Kloner A. 2013. Wine Production in the Land of Israel in Antiquity: Advancement in Research or a Completely New Approach? Cathedra 145:15–36 (Hebrew). Dray Y. 2003. The Wine Making Process in the Improved Byzantine Winepress. In Y. Eshel ed. Judea and Samaria Research Studies 12. Ari’el. Pp. 219–228 (Hebrew). Dray Y. 2011. 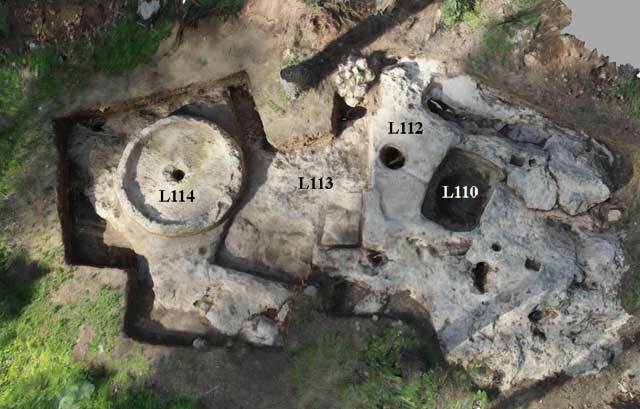 The Complex Winepress at Horbat Siv: Analysis and Interpretation. ‘Atiqot 65:89–92 (Hebrew; English summary, p. 70*). Frankel R. and Ayalon E. 1988. Vine, Wine Presses and Wine in Antiquity. Tel Aviv (Hebrew). Getzov N., Tepper Y. and Tepper Y. 2017. Evidence of a Flourishing Ancient Viticulture in Light of the Excavations near Khirbat el-Hashash (Midrakh ‘Oz), in the Rural Area between Gevaʻ and Legio ‘Atiqot 89:75–*132* (Hebrew; English summary p. 119–122). Kohn-Tavor A. 2015. 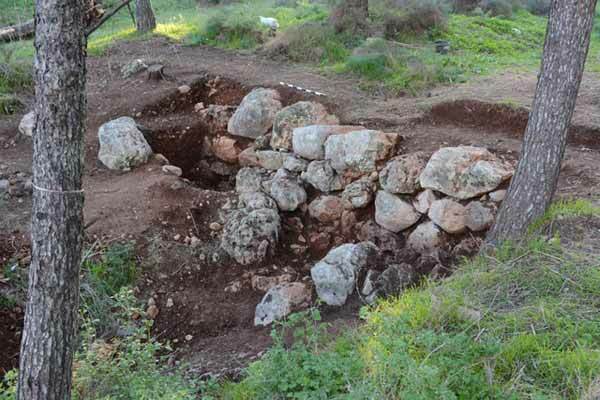 Salvage Excavation at Nurit (Nuris) The Nelson Glueck School of Biblical Archaeology 2015/3:35*–40* (Hebrew; English summary p. 216). Sa‘id K. and ‘Ad U. 2011. Horbat Siv: Quarries, Burial Caves, Kilns, Agricultural Installations, Roads and a Columbarium. ‘Atiqot 65:65–87 (Hebrew; English summary pp. 68*–69*). Syon D. 1995. Nuris. ESI 14:73. Tepper Y. 2009 Nuris, Survey. HA-ESI 121. Tzori N. 1977. The Land of Issachar: An Archaeological Survey of the Gilbo‘a Hillside, the Jezreel Valley and the Lower Western Galilee. Jerusalem (Hebrew). 2. 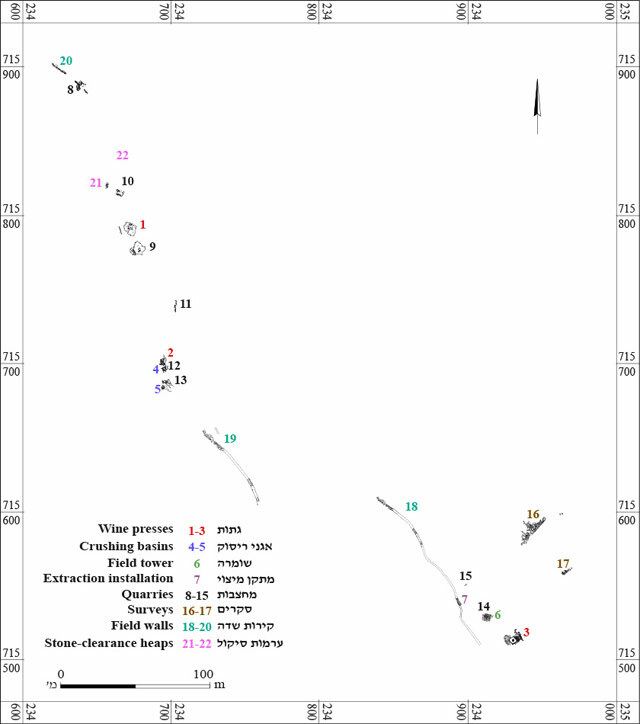 Distribution map of excavation areas. 3. Winepress 1, plan and section. 4. Crushing Basin 114 and Winepress 2, aerial view. 5. Crushing Basin 114 and Winepress 2, plan and section. 6. Winepress 2, Collecting Vat 110, looking west. 7. Winepress 3, aerial view. 8. Winepress 3, looking south. 9. Winepress 3, plan and sections. 10. Crushing Installation 116 and Tomb 23, plan and section. 11. Crushing Installation 116 and Tomb 23, looking south. 12. Field Tower, plan and section. 13. Field Tower, looking southeast. 14. Crushing Installation beneath W200, looking east. 15. 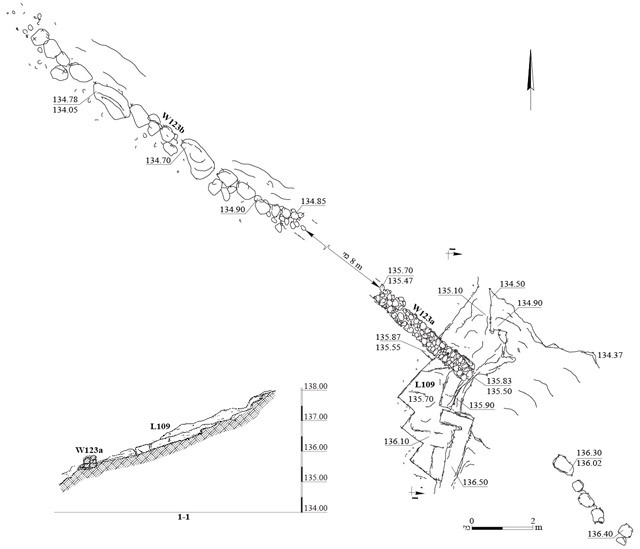 Quarry 8 (L109) and W123, plan and section. 16. Quarry 9 (L104), looking northwest. 17. 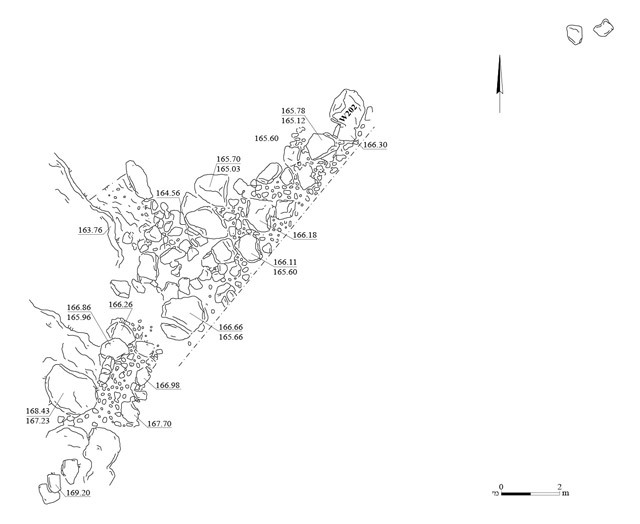 Quarry 9 (L104), plan and section. 18. 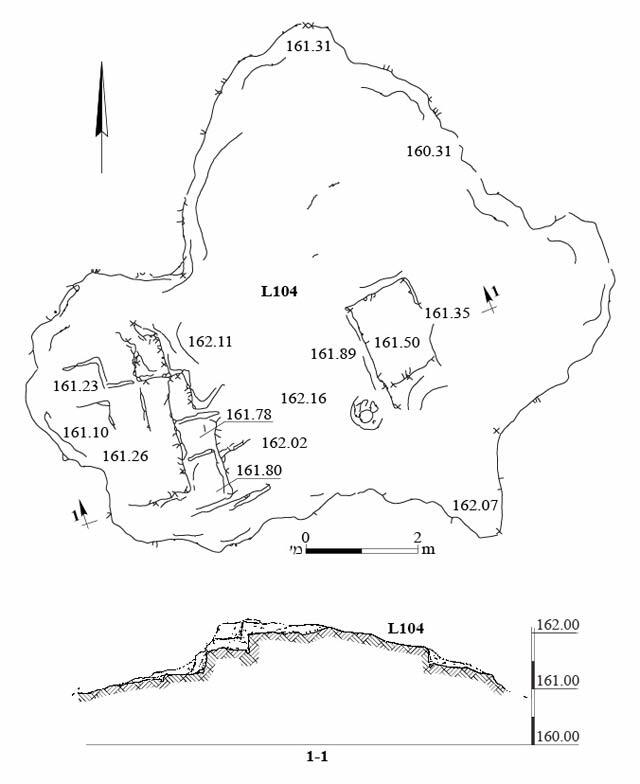 Quarry 11 (L103), plan. 19. Dam 16 (W202), plan. 20. Dam 16 (W202), looking northeast. 21. 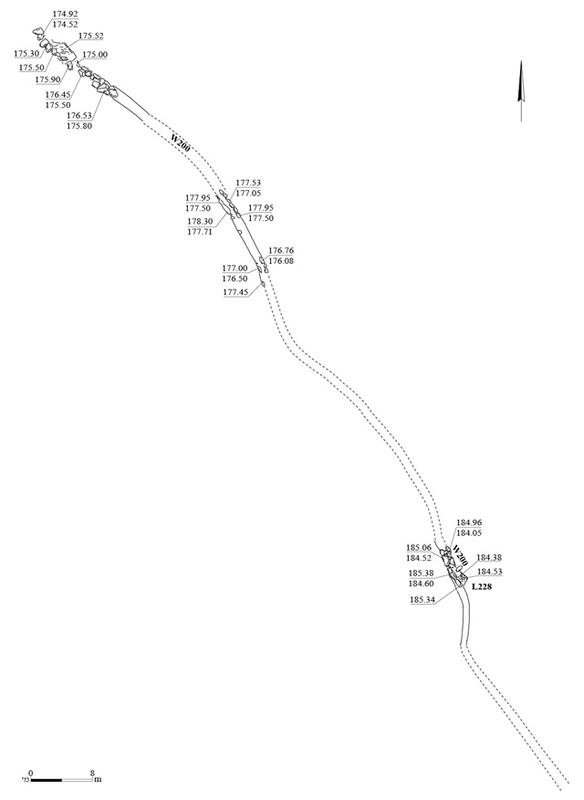 Dam 17 (W213), plan and section. 22. Dam 17 (W213), looking east. 24. Wall 200, looking southeast. 25. Wall 123, looking southeast. 26. Stone-Clearance Heap (L108), looking north. 27. Cist tomb, looking east.